History: US 17 is an original US Highway. Here is a geographic look at its history. US 17 appeared in North Carolina in 1927. It entered from South Carolina at Fair Bluff using Causey Rd and headed east with NC 202 to Chadbourn along today's US 76. Then US 17 hooked up with then-NC 20 and headed east with today's US 74-76 Bus through Chadbourn and Whiteville (except used "old US 74" loop at Pine Log Branch. East of Whiteville, US 17 followed today's NC 214 through Hallsboro, Lake Waccamaw and Bolton. Then US 17 followed today's US 74-76 through Delco. At Leland, US 17 followed Old Mill Rd to Village Rd NE. US 17 followed this to Belville, then used the closed causeway just south of current US 17-74-76 across the Brunswick River. In 1929, US 17 was rerouted onto today's US 76 from the SC line to Fair Bluff. NC 202 stays north of RR into S.C. It was placed on the general corridor of today's US 17 from the South Carolina line through Shalotte and Bolivia to Belville. This replaced US 117/NC 30. The old route from S.C. to Chadbourn became US 76 and Chadbourn to Belville became US 74-76. In Sept 1975 (NCDOT), US 17 was rerouted at Belville to its current US 74-76 approach, leaving behind SR 1551 Blackwell Rd. 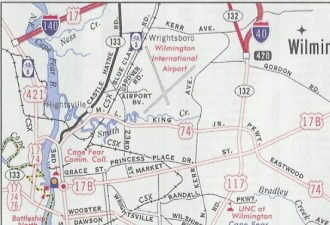 In Jan 1978 (NCDOT), US 17 was placed on new construction in the vicinity of what is now the south end of US 17 Business for Wilmington west of the Cape Fear River. 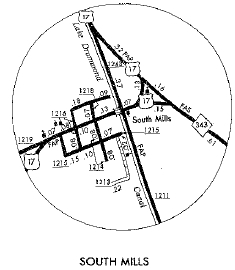 In June 1980 (NCDOT), US 17 was put on a new alignment in the Town Creek area, leaving behind SR 1701 Zion Church Rd. In July 1991 (NCDOT), US 17 was placed on a new bypass of Bolivia leaving behind US 17 Business. 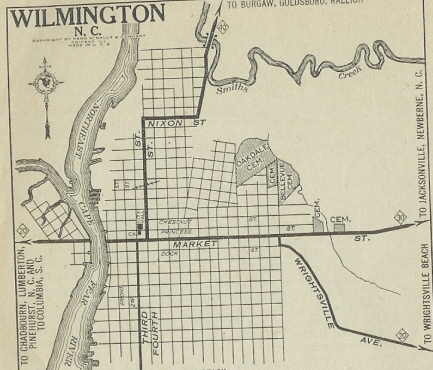 At first US 17 used a ferry directly across into Wilmington onto Market St where US 17 then dropped NC 20 and picked up NC 30 on Market St out of town. In 1929, US 17 was rerouted to follow today's NC 133 routing north of Belville in a loop to cross the Cape Fear River and the NE Cape Fear River. US 17 then headed south on 3rd St to Market. In Sept 1969 (NCDOT), US 17 was rerouted to enter Wilmington on a new bridge directly from Belville to downtown Wilmington. NB US 17 then used Dawson St and 17th St to Market St. SB used 16th St and Wooster St. 16th and 17th had been part of US 76 but the rest was new primary routing. The old route became US 421 north, then NC 133 across the Cape Fear and NE Cape Fear Rivers. 3rd St and Market St out to 16th became unnumbered for a while. In July 2006 (NCDOT), US 17 was rerouted again at Belville to proceed north with US 421/NC 133 to the new I-140, then US 17 followed I-140 all the way over to the longtime US 17 near the Pender County line. The old route into downtown became an extended US 17 Bus; Wooster/Dawson remained US 76; 16th/17th became unnumbered; Market St east of 16th out to the new US 17 freeway became more extended US 17 Business. In May 2017 (NCDOT), US 17 was rerouted back through Wilmington replacing US 17 Business across the Cape Faer River, then following US 76 out to Oleander, then north on Military Cutoff (was once US 17 TRUCK) back to Ocean Highway and replacing more US 17 Business back out to the NC 140 freeway. The old bypass of Wilmington remained parts of US 421, I-140, and NC 140. When US 17 was established in 1927, it was added to NC 30 from Wilmington to Windsor. North of Wilmington US 17 used today's 17 Business and US 17 to Jacksonville except through Verona. US 17's original Jacksonville routing used SR 1402 Old Bridge St east to Court St north to Chaney Ave east which curls north back to today's US 17 Business. North of Jacksonville, US 17 followed its current route through Maysville and Pollocksville to Craven County. 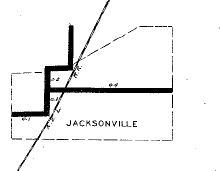 Between 1939-44, US 17 was rerouted to the current US 17 Business routing through Jacksonville. About 2003, US 17 was rebuilt to bypass Verona leaving SR 1122 Old US Hwy 17. In Nov 2006 (NCDOT), US 17 was put on the existing NC 24 freeway around the east of Jacksonville and continued on new freeway back to US 17 near Western Blvd. The old route became US 17 Business. When US 17 was born it followed current US 17 Business except it used the Old Pollocksville Road segments and approached New Bern on Trent Blvd and Pollock St. to Front St, then north to Johnson St east across the river to Bridgeton via Bridge St then B St north. US 17 then followed Old Vanceboro Rd (2 segments); Forest Rd; Old Brick Rd. 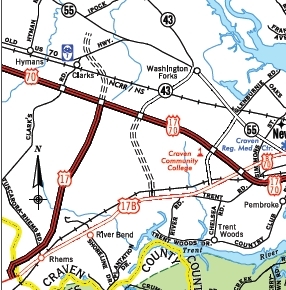 The 1930 Craven County map clearly shows US 17/NC 30 using these old alignments. NC 30 used most of 17 Business through Vanceboro. 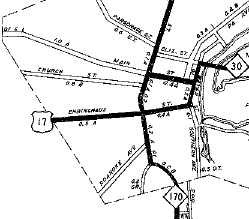 If US 17 used Old Washington Rd to nearly Beaufort County it stopped doing so before 1929. By 1930, US 17 was rerouted in New Bern to head north on George St from Pollock St to Broad, then east to Front and north to Johnson. In 1931, US 17 was removed from Old Pollocksville Rd west of New Bern and also placed onto modern US 17 and 17 Business from Bridgeton through Vanceboro to Beaufort County. 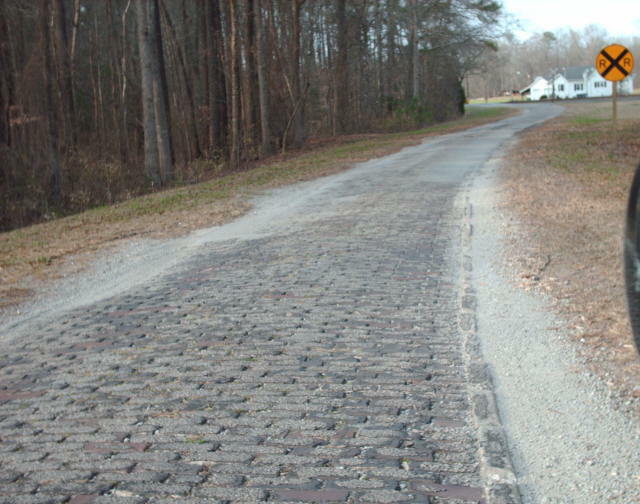 These old alignments in Craven County were narrow brick roads. One segment of this still survives - Ernul Brick Rd is still a VERY narrow brick road. Between 1950-53, US 17 was rerouted in New Bern to stay on Broad St across a new bridge over the Neuse, then replaced a bit of NC 55 on C St. In 1960, US 17 was removed from Trent Blvd and Pollock St in New Bern and put on the current US 17 Bus and Broad St (partly NC 55 today). In 1961, US 17 was placed on an eastern bypass of Vanceboro leaving behind US 17 Business. In May 2000 (NCDOT), US 17 was removed from New Bern altogether and sent with the existing US 70 freeway east, then north across a new Neuse River Bridge to connect up with US 17 onD St in Bridgeton. Broad St in New Bern became US 70 Business. In July 2011 (NCDOT), US 17 was placed on new freeway constructed from just south of the Craven/Jones line near Rhems to US 70, then added to more US 70 freeway. 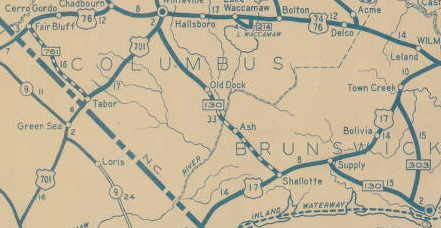 The old route through Rhems and suburban New Bern became US 17 Business. US 17 followed US 17 Business through Chocowinity and Washington, with only a slight alignment change east between the Tar-Pamlico Bridge and Wichards Beach Rd. 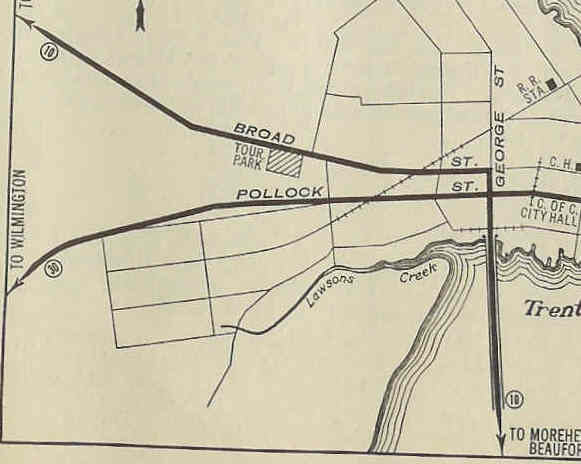 US 17 followed its current routing to Williamston, then used today's US 17 Business through town. US 17 then picked back up US 13-17 to Windsor, using US 13 Business to downtown, then NC 308 east to current US 17 Business. US 17 then followed this out to current US 17 and on over to the Chowan River. East of Windsor US 17 used the original NC 342. About 1954, US 17 was placed on a new bypass around Williamston. The old route became US 17-A (now 17 Business). 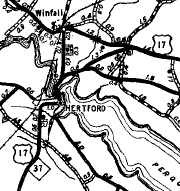 In 1956 or 1957, US 17 was placed on a bypass around the east side of Windsor, leaving behind US 17-A. Today this is US 13 Bus and NC 308. In Sept 2003 (NCDOT), US 17 was placed on the US 13-64 freeway around Williamston, leaving behind more US 17 Business and a little US 64-A. In 2008, US 17 was sent around the west side of Windsor with US 13, then used new freeway to the north of Windsor. This left behind the current Windsor US 17 Business. In Feb 2011 (NCDOT), US 17 was placed on new freeway around the east of Chocowinity and around the west of Washington. The old route through these cities became US 17 Business. US 17 used US 17 Business through Edenton, then US 17 towards Hertford. There, US 17 followed US 17 Bus into town, then NC 37 to Winfall. US 17 then used Main St Ext east back out to US 17. US 17 used Old US 17 through Woodville. 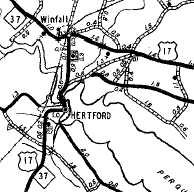 In 1945 or 1946, US 17 was placed on upgraded routing to avoid Winfall, using today's US 17 Business. 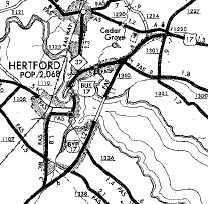 In 1966, US 17 was placed on its southern bypass of Hertford leaving behind US 17 Business. 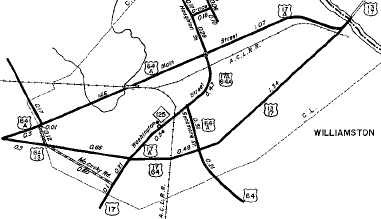 In Feb 1972 (NCDOT), US 17 was given its bypass of Woodville leaving behind Old US 17 Rd and Marian Av. 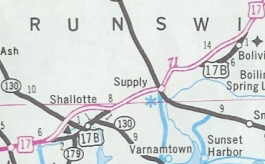 In Aug 1977 (NCDOT), US 17 was given its northern bypass of Edenton leaving behind US 17 Business. US 17 used the original US 17 bypass of Elizabeth City to today's US 158 east to US 17 Business, then north out of town. Between 1931-36, US 17 was removed from the Main St approach to Elizabeth City to the current US 17 Business approach. About 1953, US 17 was placed on a bypass of central Elizabeth City, leaving behind US 17-A (now US 17 Bus). US 17 followed Road St out to US 158, then used Northside Dr to Morgans Corner, then Old US 17, a bit of US 17, then US 17 Business through South Mills. From here, US 17 followed current US 17 to Virginia except it stayed behind the current welcome center. Elizabeth City to Morgans Corner was NC 34 and Morgans Corner to Virginia was NC 341. 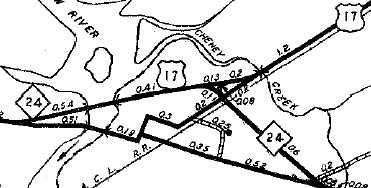 In April 1966 (NCDOT), US 17 was removed from now-SR 1243 Mullen St along the Dismal Swamp canal in South Mills and instead replaced SRs 1241 Main St, SR 1242, and a bit of NC 343 to curl around the north end of South Mills. 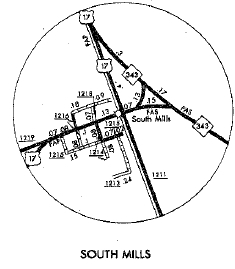 In Sept 1984 (NCDOT), US 17 was placed on new alignment west of South Mills. This left behind US 17 Business. In Nov 1984 (NCDOT), US 17 was placed on new alignment north of Elizabeth City bypassing Morgans Corner. This left behind Northside Dr and Old US 17 Morgans Corner Rd. US 17 is a major north-south corridor in eastern North Carolina...only 58 miles are still 2-lane, with 13 of those under construction to widen. US 17 has mileposts at least from S.C. to Wilmington and from near Woodville to Virginia. In the 1925 US Route plan, US 17 was initially designated US 13 from Wilmington to Virginia and US 76 from Wilmington to South Carolina. US 17 was assigned to a stretch of road in South Carolina. The US 17-70 interchange east of New Bern is partially over the Neuse River and is a treat to drive through. For years there was a US 17 Truck signed on US 76 and Military Cutoff east of Wilmington. This was removed when US 17 was placed onto the new freeway that includes I-140.